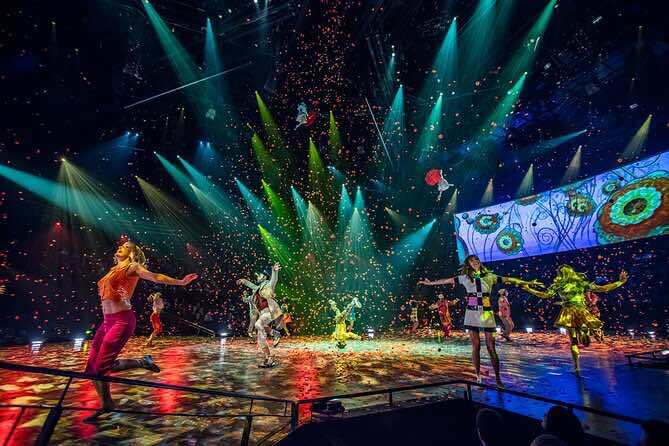 The Beatles LOVE by Cirque du Soleil Las Vegas is an amazing show that brings to life the music of the beloved Beatles. This 90-minute show intertwines the politics, pop culture and history of the 1960s into the choreography of this musical show. There are multiple covers by The Beatles LOVE during the show which at times is a happy conglomeration of aerial tricks, confusion and dance. LOVE features around thirty songs from the Beatles that include such favorites as Hey Jude and I Want to Hold Your Hand. Other songs are featured with intricate stage shows like Strawberry Fields Forever with lighting and stage props that even make Alice in Wonderland look tame. There is an aquatic themed portion that is supplemented with wonderful ballet movements that stun the crowd during Octopus’s Garden. Lucy in the Sky with Diamonds has one aerial artist in a sparkling wardrobe who attempts many feats in the air that will blow your mind away. Here Comes the Sun features aerial artists of the female persuasion who have all the right yoga moves during their routine. Help! has synchronized jumps, twists and flips as acrobatic performers fly across the stage. The performance of All You Need is Love is enhanced with a multimedia display of Beatles photographs and video that definitely sends a message of love to the awe struck audience and Get Back is centered on a rooftop that includes a variety of interesting contortions as well as dance moves. The Beatles LOVE is a wonderful walk down the Beatles Abbey Road with a supporting cast of premier artists. LOVE was originally conceived by George Harrison and Cirque du Soleil genius Guy LaLibert. After Harrison’s death the remaining members of the iconic rock band pitched in to help make the production something that would make the Beatles proud. Dominic Champagne was hired as the director of The Beatles LOVE with Giles Martin as the music director, who is the son of the famed musical director of the Beatles Sir George Martin. The two men have made this event more than a just a concert of the Beatles greatest hits and a spectacle of a show which features music from the actual Abbey Roads Studio recordings. This Cirque du Soleil performance is heavy on dancing and a variety of aerial acrobatics as well as extreme sport tricks. The performance of LOVE includes sixty artists who perform a variety moves with unconventional assistance from items like trampolines and roller skates to give the show an urban feeling. The show is enhanced by incredible multimedia effects that include a tremendous amount of psychedelic videos projected onto curtains behind the artists and stage props. Other exclusive video clips during the show include a jam session from the Beatles Abbey Road Studio and several of when the fab four were quite younger. The video projections and the costume wardrobes of the artists are masterful together on stage. The LOVE Theater at the Mirage Hotel and Casino has the perfect atmosphere for The Beatles LOVE. The 2,000 seat auditorium has great sight views where ever you might be seated. The sound system is enhanced by over 6,000 speakers throughout the venue to bring crisp low and high tones of the fabulous music. What looks like confusion on stage during the show is really a highly choreographed stage production that relies on the different moving parts of the show to come together in an unusual and entertaining way. For Cirque du Soleil as well as for Beatles enthusiasts this is a must see show. 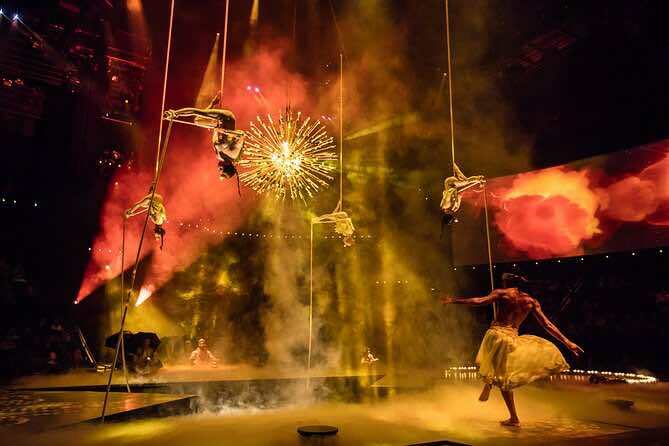 The performers of Beatles LOVE by Cirque du Soleil Las Vegas are a diverse group of people from around the world. 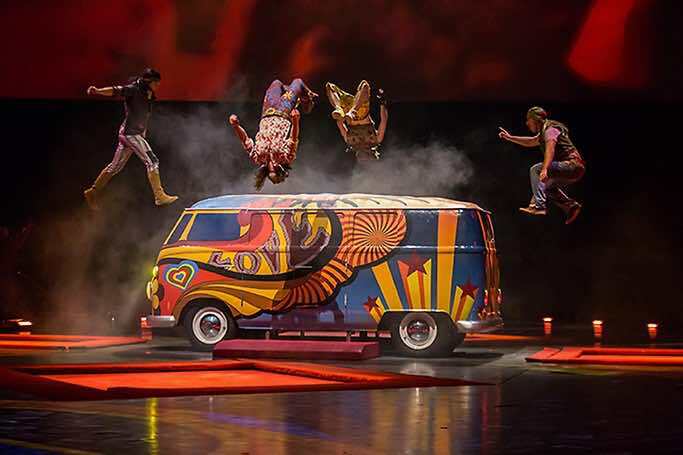 The cast features sixty extremely talented aerial, acrobatic, dance and extreme sport artists. Cast members range in age from 9 years old to Silvia Ademe who portrays Eleanor Rigby at 77 years old. The cast also includes one Olympian, Rares Orzata, who participated in the 2000 Sydney games. The director and original writer for LOVE is Dominic Champagne who graduated from the National Theater School of Canada in 1987. Over the years Dominic is credited with at least 100 theatrical accomplishments from stage to television. The music director is Giles Martin who has followed in his famed father’s footsteps. Giles Martin has brought back to life the music his father, Sir George Martin helped produce for the Fab Four during their years of recording at the Abbey Road Studio. Philippe Guillotel is the costume designer. 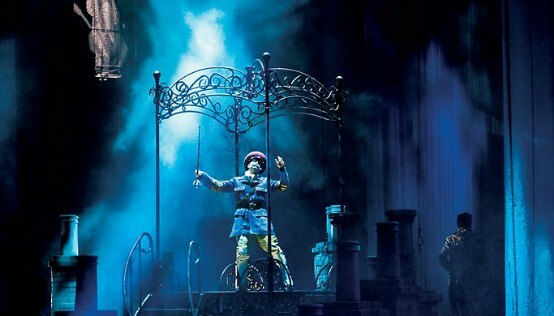 He has created literally hundreds of innovative costumes that are worn in the show. Philippe is also well known for his wardrobe creations for the opening and closing ceremonies of the 1992 winter Olympics that were held in Calgary, Canada. The Beatle LOVE by Cirque du Soleil Las Vegas is running at the LOVE Theater located within the Mirage Hotel and Casino. The venue holds up to 2,000 guests with excellent sight views. No seat in the theater is more than 98 feet away from the stage. The theater has a tremendous multimedia and lighting system. Musical shows are enhanced by more than 6,000 speakers in the theaters state-of-the-art sound system. The show is open to patrons that are five years of age or older. Show times are Thursday through Monday at 7:00 and 9:30 P.M. Beatles Love Tickets are on sale now and range from general admission tickets to VIP experience.